PARIS, France -- A Kazakh oligarch and dissident, Mukhtar Ablyazov, is being kept in custody in France after Ukraine issued a warrant for his arrest. His family have expressed fear that Ukraine may hand him over to Kazakhstan if he is expelled from France. He once headed BTA Bank in Kazakhstan but fled in 2009 amid accusations he embezzled billions, which he denies. BTA Bank says it tipped off France about his location. He was detained at a house near Cannes on Wednesday. In a statement sent to BBC News, BTA Bank said it had "provided information about Mr Ablyazov's whereabouts to French authorities, who acted promptly to arrest him based on the Interpol 'Red Notice' issued by Ukraine relating to criminal proceedings on the frauds committed on the bank". The 50-year-old, a former Kazakh energy minister, says the allegations are designed to eliminate him as a political rival to the authoritarian Kazakh President, Nursultan Nazarbayev. In 2001 Mr Ablyazov launched a pro-reform party and was jailed for abuse of public office, but was later pardoned. Human rights campaigners have accused Mr Nazarbayev of silencing independent media and persecuting political opponents, as well as using the police and courts to keep a tight grip on power. French officials say Ukraine now has 40 days to submit the dossier on Mr Ablyazov, so that France can decide whether there are grounds to extradite him. France has an extradition agreement with Ukraine, but not with Kazakhstan. In a statement on Mr Ablyazov's website, posted after his arrest in the south of France, his daughter Madina and son Madiyar urged France not to extradite him. "Our father is in grave danger. In the past in Kazakhstan he was a political prisoner, he was tortured, and he has been targeted for assassination several times. We are afraid that France will render our father to the mercy of Nazarbayev!" they said. BTA Bank took legal action against him in the English High Court, seeking to recover $6bn (£4bn) in assets allegedly stolen by him. In 2011, he was granted political asylum in the UK, but later left the country after being sentenced to jail for contempt of court. According to BTA Bank, "his fraud caused well over half a billion dollars in losses for UK creditors when the Bank had nearly collapsed". He was wanted by Kazakhstan, Russia and Ukraine for alleged large-scale fraud at BTA Bank. The bank, once the biggest in the oil-rich Central Asian republic, had branches in Russia and Ukraine before it went bankrupt and was nationalised. Mr Ablyazov was detained in Mouans-Sartoux, a few kilometres outside Cannes. Russia has been seeking his arrest through Interpol on charges including fraud, money-laundering, abuse of authority and document forgery. The Kazakh prosecutor-general's office said on Thursday that Interpol had informed it of the arrest. 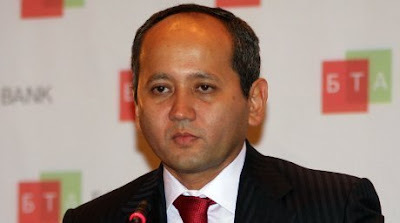 Mr Ablyazov was jailed in 2002 in Kazakhstan, but was pardoned in 2003 and spent the next two years in Russia. He then returned to his native country, where he led BTA Bank until 2009. The bank says the English High Court has authorised the sale of three "luxury UK properties" belonging to him, as part of the asset recovery procedure. In July, the Italian interior minister's chief-of-staff resigned amid a political storm over the deportation of Mr Ablyazov's wife and six-year-old daughter. Italy has since admitted that the expulsion was illegal and asked Kazakhstan to return them.